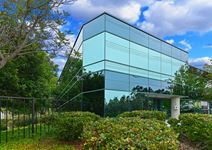 Located in Carlsbad, a growing area for communication technology, life sciences, clean technology and action sports this business centre provides professional yet hip and relaxed shared office space . This center is beautiful and unique and modern center. Enjoy the conference rooms for team collaboration or some peace and quiet for a conference call. The break lounge space is perfect for a mini break on-site to refresh your mind. This center has a copy and print facility, reception service, and administrative support to meet all of your business needs. This center will not disappoint. Take a tour and find out about all of the other amenities it has to offer. This center is located in Carlsbad right off the Pacific Ocean. How much better can it get with working right next to the beach? There are five local train stations less than five miles away and all of the main airports less than thirty. This location is known for its development of commercial and residential mix and there are local dining and shopping areas within in blocks. Located in the premier Carlsbad area this office space has been designed with an industrial yet modern feel that helps to motivate creation and support a thriving community of professionals and start-up businesses. Added benefits include reception services, an outdoor work area, free parking, free coffee and even free beer on tap! Situated in the heart of Carlsbad business district, this center is minutes from the airport and freeway I-5. Offering the finest quality furnished offices and virtual offices at affordable rates. With a pleasant on-site team to help your workday run smoothly, this is an excellent cost-effective solution for your business. Run by a local firm able to custom tailor programs this center offers coworking spaces, meeting rooms and executive suites suitable for businesses of all sizes in need of a professional and collaborative work environment, a few miles east of I-5 and Palomar Airport Road. This business centre located close to hotels, and shopping, includes great reception staff with well designed conference rooms with the ability to conduct videoconferencing. Easy parking. Close to the Flower Fields. This centre comes with all the strapping’s to make this a perfect working environment set in a great outdoor setting offering a host of sport activities. Includes reception staff and meeting rooms.